If you like taking selfies with the GoPro but you don't want the mount or pole to appear in the shot, the GoPro 3-Way might just be what you're looking for. It has arms that fold, which can be manipulated in a way that you won't have the pole in the shot. And it's not just an extension arm; the 3-Way has a handle, which can be used as a grip on its own, and a mini tripod stored inside it, which can also be used on its own or combined with the handle. The whole thing expands to 20" and collapses to 7.5". 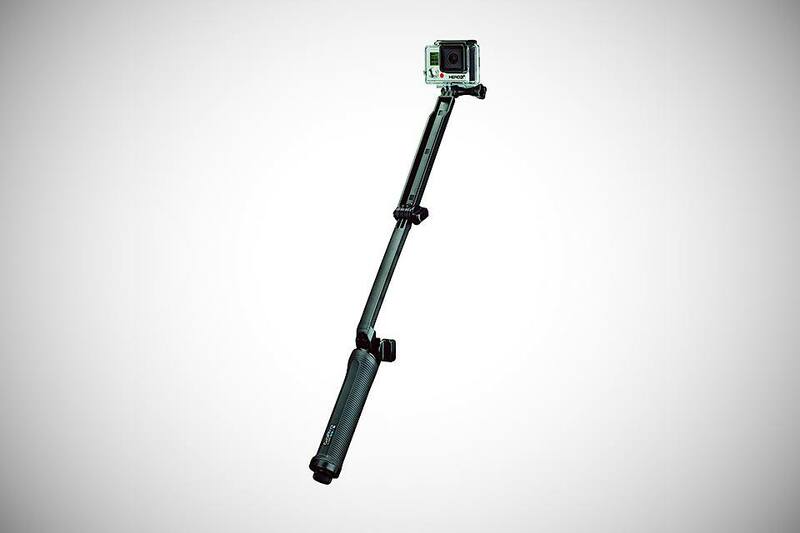 It's one of the most versatile accessory for the GoPro and it's very light. That's because it's made of plastic, which also makes it feel quite cheap. Unfortunately there's nothing else like it on the market at the time of writing. So if you have the money to spend and can't wait for one that's of higher quality to be available, just go for it. Some people like it, some don't.